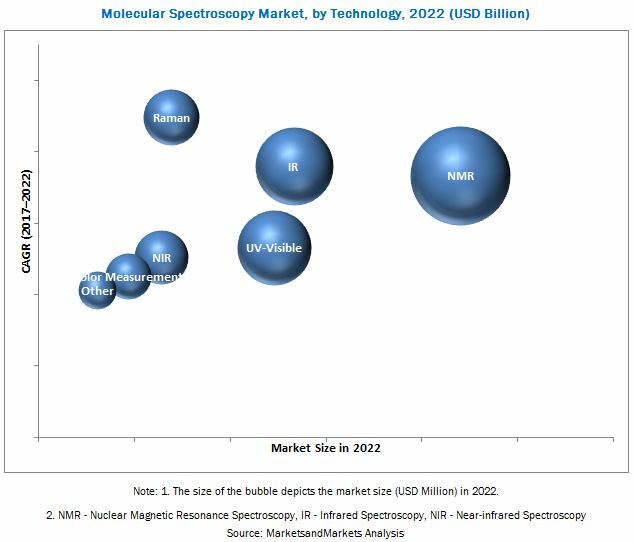 According to a new market research report "Molecular Spectroscopy Market by Technology (NMR (FT, Continuous Wave), UV-Visible (Array-based, Dual-beam), IR (Terahertz, Benchtop), NIR (FT-NIR), Raman (SERS, TERS, FT Raman)), Application (Pharmaceutical, Food, Biotechnology) - Global Forecast to 2022", published by MarketsandMarkets™, the market is expected to reach USD 6.85 Billion by 2022 from an estimated USD 4.98 Billion in 2017, at a CAGR of 6.6%. The growth of this market is majorly driven by food safety concerns, the growth of the pharmaceutical and biotechnology industry, technological advancements in molecular spectroscopy and application of molecular spectroscopy in environmental screening. Browse and in-depth TOC on "Molecular Spectroscopy Market"